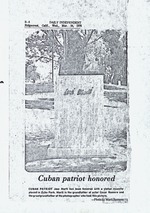 ﻿ Newspaper clipping, “Romero family has its very own hero,” The Daily Independent, includes photocopies of photo of monument in Echo Park and news article. Newspaper clipping, “Romero family has its very own hero,” The Daily Independent, includes photocopies of photo of monument in Echo Park and news article. the greaigrandfather of the photographer who took this picture. Snamesake, Cuban patriot Jose Mal'ti. On January 27, the 123rd birthday of. ~.author, an orator, and a patriot. national hero and ~"Apostle of~. prisoner of the Spanish regime. lecture in the cause of Cuban liberty. ;and Dana of the Sun, among others. dreams. In 1895, when be was only 42 . Namesake, Cuban patriot Jose Martl. prisoner of the, Spanish regime..
he find the freedom to speak and . lecturee in the cause of Cuban liberty. love for human worth was perhaps the.
. greatest factor in solving the race-.